Emergency first aid courses are one of the most popular courses offered to Canadians. Participants can select from a variety of providers and can partner the course with CPR level A or C. The course traditionally includes training in CPR level A, however, participants have the option of selecting a higher level CPR such as CPR level C. Part of the curriculum of emergency first aid training is certification in the use of automated external defibrillators (AED’s). Successful participants receive a first aid certificate that is valid for 3 years and meets several workplace and academic standards for a number of provinces in Canada. To register for an emergency first aid course near you visit our emergency first aid locations page and select your area. We are partnered with varying providers, including St. Mark James Training through which we offer emergency first aid and CPR providers throughout Canada including Calgary, Vancouver, Edmonton, Kelowna, Surrey, Saskatoon, Regina, Ottawa and Winnipeg. We partner with the highest quality providers in your region. The length of an emergency first aid course is 8 hours and is typically completed in one day, however, it can be taught in a two day split. The cost of the course depends on the workplace approved training provider and your location. Costs vary from $75-110. The course fee includes your manual, taxes and the workplace approved certification. CPR level A- This level teaches participants basic CPR techniques to an adult by one rescuer. Contact your local workplace approved training provider to determine if they offer the CPR level you require. CPR training is a essential component of emergency first aid. Emergency first aid involves training for recognition and treatment for basic first aid scenarios. Participants will learn to respond to heart attacks, respiratory emergencies, stroke’s, angina and shock and injuries. 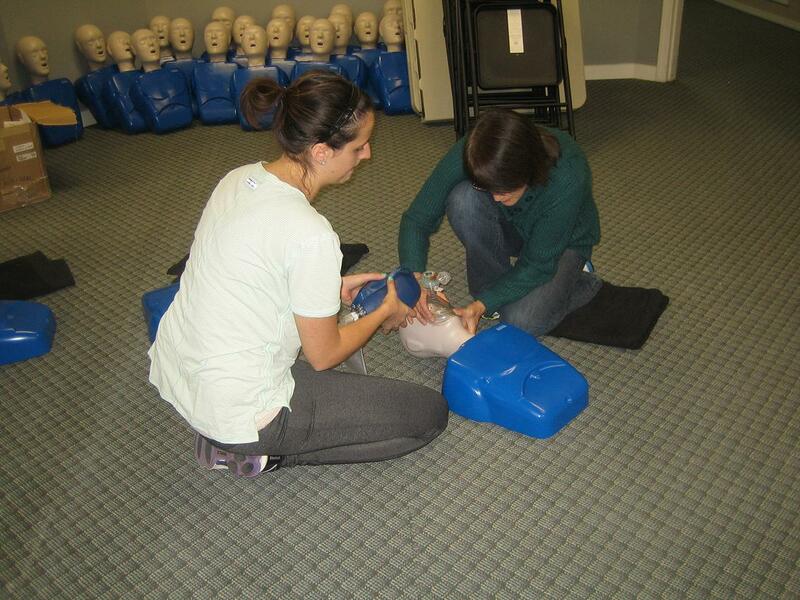 Principles of first aid – Participants will learn about the basic principles involved in administering first aid. Legal implications – Participants will learn about the legal implications of first aid including first aid on children and infants and first aid requirements at the workplace. Anatomy and physiology – Prior to learning first aid and CPR, participants will learn basic anatomy and the physiological components involved during CPR. Barrier Devices and Personal Protective Equipment – Participants will learn about disease transmission and barrier devices when administering first aid or CPR. Unconscious patient assessment – Participants will learn how assist an unconscious patient. AED use and operation – Participants will learn the how to use and administer automated external defibrillators. Adult and Child Victim CPR – Participants will learn single rescuer CPR techniques for adult and child victims. Obstructed Airway conscious and unconscious victims – Participants will learn the skills and knowledge to recognize and treat adult and child patients with obstructed airways. Respiratory Emergencies – Participants will learn to recognize and react to patients with asthma, hyperventilation and anaphylaxis. Circulatory Emergencies – Participants will learn to treat, recognize and provide care for patients with circulatory emergencies that include shock, major bleeding, heart attack, angina, stroke and transient ischemic attacks. Upon successful completion of the emergency first aid course participants will receive a workplace approved emergency first aid, CPR and AED certificate that is valid for 3 years. Certification can be issued as a wallet sized card or in a large 8 x 11 inch wall mount certificate. The wallet sized certificate meets Health Canada and workplace standards for individuals in many provinces and is valid throughout Canada. Upon completion of the course the participant is registered with the St Mark James. Re-certification courses are not available in all provinces. Check with the provider in your area (select from our locations page) to determine if a recert courses is available for you. Participants wanting to get certified in OFA level 1 (WorkSafe BC) certification should enrol in workplace emergency first aid courses. This course is available only with our providers (Vancouver First Aid) in British Columbia. Why St Mark James / Vancouver First Aid? We are fun and entertaining. We want you to have fun while you learn. We strive to never cancel a course. We know that most of our customers require certification for their workplace. Our cancellation policy. As long as you give us 72 hours notice before the course we will give you a full refund or help you transfer into the course that works better for you. For more information about these components of emergency first aid enrol into a course or select the desired topic from the main or side menu.